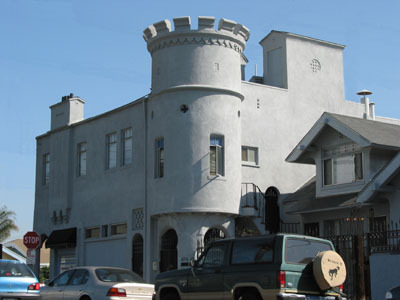 I drive around Long Beach, California quite a bit as part of my job and I keep passing this one castle on the corner Seventh Street and Orizaba Avenue. I seem to remember the name of the castle as Croydon Castle. I think it was built in the late 1920's It's a three-story keep with a crenellated turret on one corner and a kind of chapel looking one-story residence off to one side. The upper floors of the keep are used as apartments and the ground floor is for business. There seems to be quite a turnover of businesses at this location, nothing stays more than a couple of years. The name may have come from an article a couple of years ago in the local paper, the Long Beach Press Telegram. Information, photo, and links courtesy of Al Turek.